I am fascinated by names. Now, it doesn’t mean I’m great with names, in fact, I really (REALLY) stink with names. I don’t know if it’s something that has just gotten worse as I’ve gotten older, or if it’s the fact that I have the attention span of a gnat (I’m guessing it’s the latter of the two). But even though I’m lousy at remembering names, it’s cool to know God isn’t. Psalm 147 tells us, “He determines the number of stars and calls them by name.” Did you catch that? The stars, people! If God cares about the names of the stars, how much more He must care for us to call each of us by name. I wonder if the unique name of our soul is what the Spirit whispers when we are lost. Jesus says, “He leads his own sheep by name and leads them out…and his sheep follow him because they know his voice.” (John 10:3,4) He calls us by name, and we know His voice. How cool is that?! This last weekend, at the She Speaks conference I attended, they had posted the many names of God. After praying over every lady’s name in attendance, they placed her name on the name of God to which they were led. 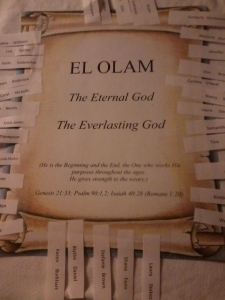 My name was placed by El Olam – The Eternal God, The Everlasting God. “The One who works His purpose throughout the ages.” It made me realize, I am here…for such a time as this. What is God’s name for you today? Whatever we need Him to be, He can be for us. We only need to call out to the One that saves, the Lord of Lords and King of Kings…Jesus. Thank You for knowing my name. Thank You for calling out to me in a voice that speaks to my soul, and restores my faith. Please cover me with Your peace today, and talk with me throughout my day. Help me to listen, Father, to the only voice that matters…Yours. What name does the Father call you by? Cherished? Loved? Chosen? Beloved? Wouldn’t it be cool to catch a glimpse of the names God calls us by? If you so feel led, please post the name by which God is calling you today. Next postWhat’s It Taste Like? I have felt God call me beloved before. It is very humbling.